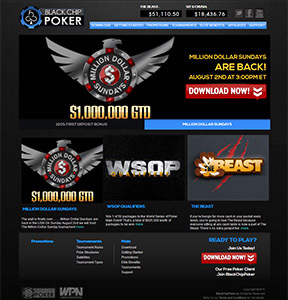 Black Chip Poker is part of the Winning Poker Network, the #2 poker network for players in the United States. That means Black Chip Poker features a huge number of players at the cash tables. For players new and old at the online poker site, there are tons of rewards to reap as a result. First and foremost are the big guarantees. Black Chip Poker offers a signature $50,000 weekly tournament that jumps up to $100,000 on a regular basis. There’s also the Sunday Special, a unique weekly online poker tournament that increases by $5,000 each week as long as the tournament makes the guarantee. The tournament launched in January 2015 and at the time of this initial review in April 2015, the prize pool had reached $110,000. But it’s not just about online poker tournaments. It’s about land-based tournaments, too. Black Chip Poker has become a top destination for players who want to win a seat in a major land-based poker tournament. Players can win seats in big events like the World Series of Poker Main Event, the Punta Cana Poker Classic, and several Latin Poker Series events, too.